Pesto, it has many purposes, each one good in their own right. It can be an appetizer dip, spread on a bread or used with noodles; the possibilities are endless! And lucky for us, it’s easy to make. 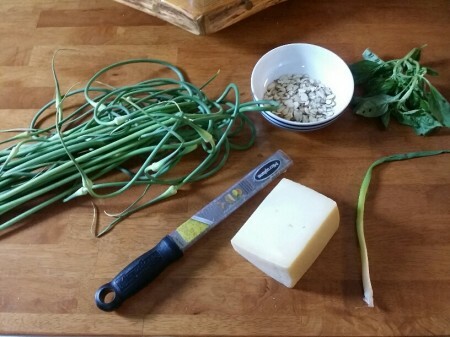 This recipe is based on garlic scapes. You may or may not know what they are. Garlic scapes are the flower buds or stalks of a garlic plant. They are removed early on in the season so that the energy will go toward the bulb. They taste amazingly awesome just like garlic. Start by prepping for the pesto. Cut the garlic scapes in usable pieces for the processor. About 2 inch pieces. Cut the ends off the green onion. 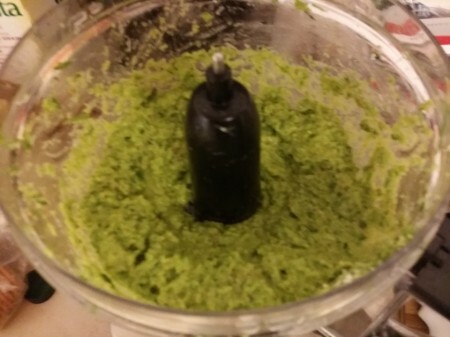 Put the garlic scrapes, basil and green onion in the food processor and start pulsing. While you are doing that, melt butter in a pan and toast the almonds. It takes awhile to get the scapes down. In a separate pan Add coconut oil or olive oil and cook chicken with celery seed on medium heat, pan covered. Back to the pesto Add salt and pepper (start with 1-2 tsp. of each), the cayenne pepper, parmesan cheese and the almonds to the food processor. Continue pulsing, you want all the pieces to be well blended and small. Once you have it at a consistency wanted. Open lid and slowly add the remainder of the olive oil while processor is still pulsing. this is very important to whip the oil in during motion. After all oil is whipped into mixture, the pesto is done. Throw 2 tbsp. in with the cooking chicken. When the noodles are finished; drain, rinse and put in a large bowl. Add about 1 cup of the pesto in to the noodles and mix. 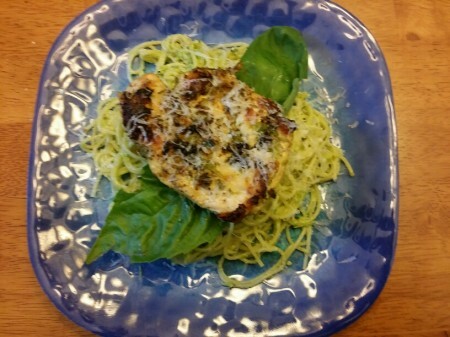 Top with a chicken breast and a small amount of parmesan cheese. Serve. Freeze the rest or use as a dip. I love to use pesto as pizza sauce, especially with feta cheese and grilled pencil-thin stalks of asparagus.